They call him the trouble maker. Because he is strong and independent and not easily doing what he is told. And because he steals all the balls at the beach. Well, that is a bit of a nuisance, especially if it is your ball he stole and you particularly liked that ball. I never have this problem: no dog can steal my ball, not even Boss. I am the fastest on the beach, you know. Anyway, I think Boss is a fabulous dog. 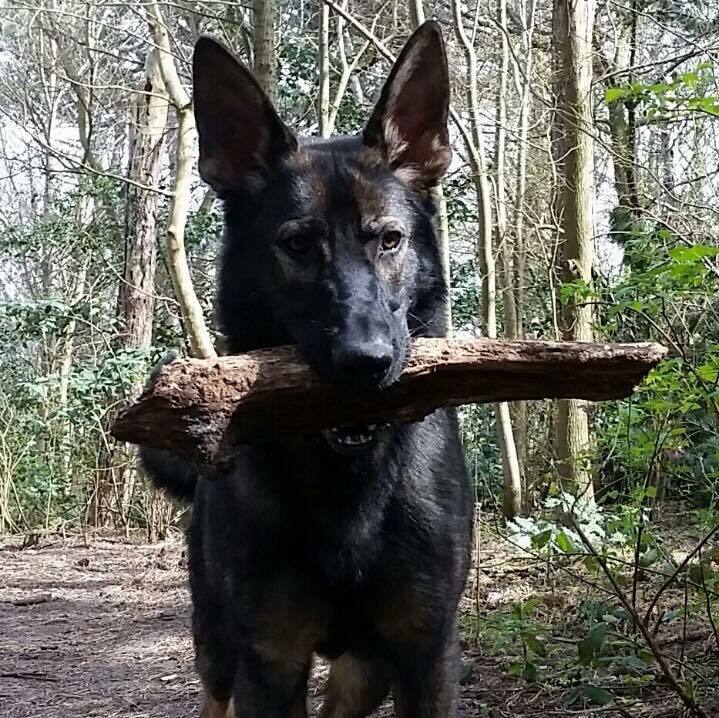 I think it is great he is strong and independent, that is what a german shepherd should be! I never have trouble with him, when we go to the beach or the forest. When we are out together we explore the surroundings and go wherever we want. I feel very safe with him by my side. When I am at his place I even sleep on his bed! We are true friends. Sometimes humans really puzzle me. They have these ideas, these conceptions, that are very odd and far from the truth. Most humans look at the world according to these conceptions. We dogs see the world as it is, because we live in the moment. Humans live inside their heads a lot, thinking and worrying too much, and therefore they often do not see things as they are. The result is that most humans notice most strongly things that confirm their ideas. Then they say: ‘I knew it was this way. I was right thinking it would be like this.’ When something happens or is that does not comply with their conceptions, they say it is an exception. Or they do not see it at all. This is a bad thing, because once they have an idea into their head, it is very hard to change it. They do not learn and, even more important, they miss most of the fun because they are thinking too much, not noticing a lot of things. With kids it is different, but from a certain age it starts getting bad. I am telling you this, because there are some misconceptions humans have about dogs that are very annoying. Like the idea we should play all the time, or the odd ideas humans have about dominance. There is another major misconception that bothers us, I will call it ‘scary breeds’. Humans think some dog breeds are dangerous. Breeds like Rottweilers, Rhodesian Ridgebacks, Pittbulls and all other kinds of bullterriers, Mastiffs, Cane Corsos, Bordeauxdogs, Dobermanns, Malinois and German Shepherds. A lot, hey? And I am sure I did not mention all of them. You see what the problem is? Nothing changes. This human still has this idea about scary breeds and he will never get the real picture. Because, as you probably guessed by now (I am expecting my readers to be intelligent humans) there are no scary breeds. Yes, some dogs are scary. And yes, some of the dogs of the breeds I mentioned can be scary, too. They are all big, strong, energetic dogs and when they do damage, it will be a lot bigger than when – say- a chihuahua bites in your shoe. But the breed itself is not scary. Are all men scary, or all women? All Germans or all English? Of course not. They are as diverse as we dogs are. Some of my best friends are German Shepherds and there is also a Rottweiler I am kind of fond of (I am sorry I do not have pictures of them, I tried to persuade them to look really mean so I could make a good picture for this post. But they refused, they are way too cool for that). I like to play with Staffordshire Bullterriers and Pittbulls, because they like playing it rough, like I do. They do not start to whine when I crash into them. I never have trouble with them. I do sometimes meet bad mannered dogs, but that does not depend on their breed. There is one especially nasty Rhodesian in this neighborhood, but in a street nearby there is a very sweet Rhodesian, too. Sometimes I meet a bad mannered Greyhound and there is also a Bichon you have to be beware of in the forest here. They are individuals, not all Bichons or Greyhounds are mean. 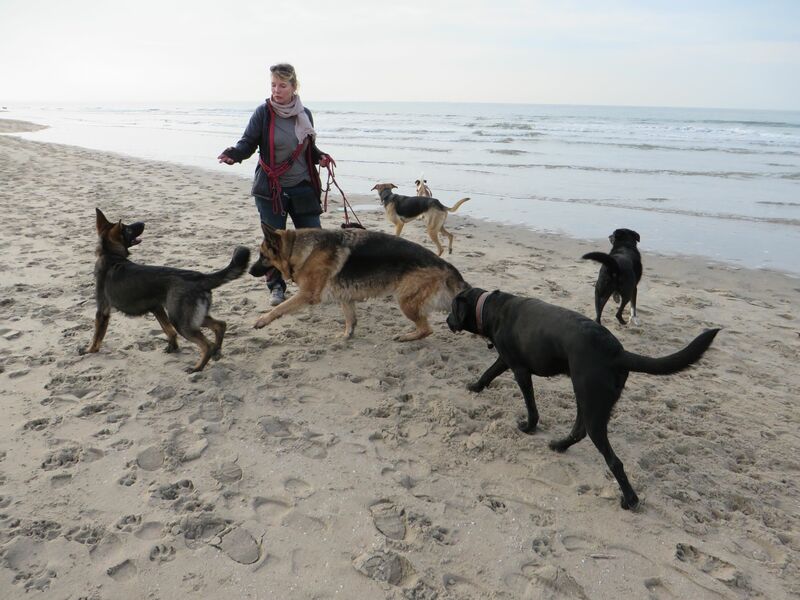 So next time, when you are on the beach or another place where there are a lot of dogs off leash, take a good look. A real look, I mean, try to really see what is happening. You will probably see a Pittbull relaxing in the sun (and not preparing some attack), a Rottweiler happily bringing a ball to his human (it is just a happy dog, not an especially good trained one), a Labrador running with a Setter and a German Shepherd. 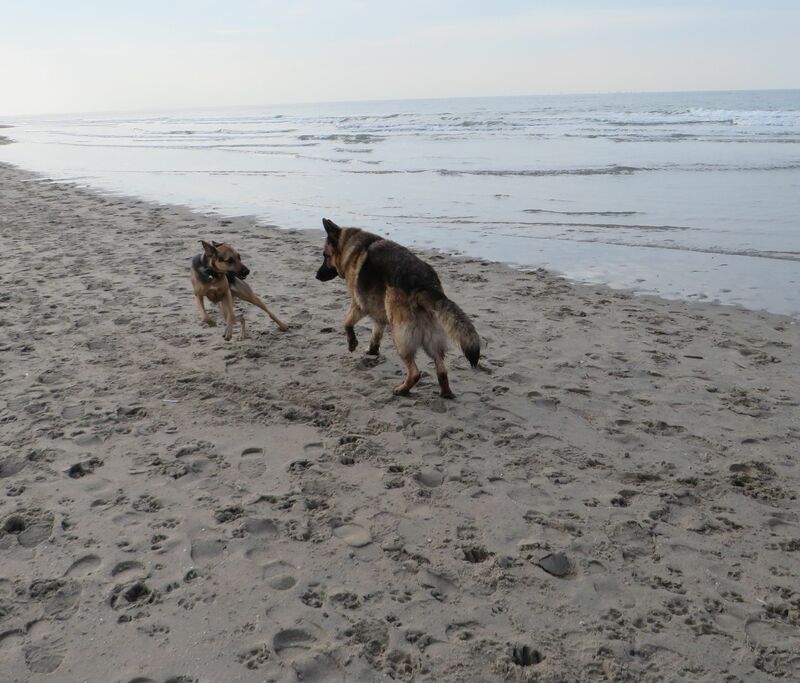 And no, the German Shepherd is not chasing them, he is playing with them. Welcome in the real world! The funny thing is he knows I will do this, but still he waits for me and tries to get me when I am almost there. By the way, we don’t do this for a long time, usually after this running around we stop and start sniffing and searching for little crabs to eat. I tease him, he is not really angry with me. He just pretends, it is a game. When I meet a dog I do not wholly trust, this is a very good Method™ to have some fun and in the same time avoid getting hurt. It only works when you are a very fast dog, mind you! Otherwise just make sure you are not in their way and do as I explained in this post.